1. 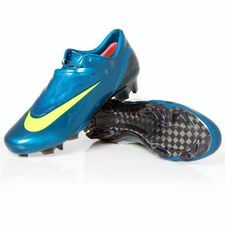 The special, limited edition designed primarily for Cristiano Ronaldo and Didier Drogba. They are almost entirely made of Carbon Fiber. They are the lightest soccer cleats ever, so far (6.7oz. 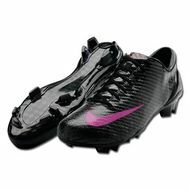 - 190 grams)…and one of the most expensive cleats ever - $400 (crazy). Only 2,508 pairs were made, each one of them numbered. As far as I know they are all sold out. I saw a pair for about $800 on eBay. 2. The second version, which I call 'a public edition' is the combination of SL's outsole (carbon fiber) and Mercurial Vapor IV's midsole and upper (Teijin microfiber). Teijin - Top Super-Microfiber material; soft, ultra-lightweight, very durable and with capability of adjusting to the foot's shape. Heel Wrap - an injected TPU heel wrap supported by a strip of Carbon Fiber...wraps the bottom part of the heel, stabilizing and protecting it. Cover Lace System  stitched, very thin and stretch lace cover. Vapor Heel Lock - exposed heel cup, reduced and positioned more laterally than in the MV III; inner foam pads hug each side of Achilles tendon above the heel to lock the foot comfortably in place. Speed Last - re-engineered contoured last that mirrors and supports the anatomical curves of your foot. Contoured sock-liner with EVA inserts reduces studs pressure. Carbon Fiber Speed Plate - seven layers of carbon composite material interwoven with TPU and polyurethane. Vapor Traction - two-piece TPU plate with direct inject bladed studs in the heel and Vapor forefoot plate with multi-directional traction pattern.